(Machu Picchu) tall city of stepped stone, home at long last of whatever earth had never hidden in her sleeping clothes. In you two lineages that had run parallel met where the cradle both of man and light rocked in a wind of thorms.." (Pablo Neruda, Nobel Prize, Heights of Machu Picchu). The Lares Trek is an excellent alternative to the Inca Trail. Taking you off the beaten track with visits to authentic Andean communities whilst being surrounded by stunning mountains, lakes and valleys this fabulous trek offers a real insight in to the lives of the people of Cusco as it once was. The route we offer starts in the village of Pumahuanca in the Sacred Valley and finishes in the hot springs of Lares with a visit to the village of Cuncani along the way. On Day 3 of the trek you take a bus from Lares to Ollantaytambo and then carry on by train to Machu Picchu. Starting Altitude - 2800m / 9186ft. Highest Altitude - 4780m / 15,682ft. Overall Difficulty - Moderate difficult (depends on your level of fitness). Our first day of the trek starts of in the small village of Pumahuanca in the Sacred Valley. We'll gently make our way up one of the side valleys covering about 14km in total and climbing about 1150m / 3373ft as we make our way towards the village of Puyoc. On our way up we'll visit the small Inca site of Pumahuanca and learn about the native plants, flowers and birds that inhabit this region. This particular route for the Lares trek is not commonly done by other companies so we can enjoy the peace and tranquility of our surroundings without any distractions or disturbance. Because so few people visit the area there is a good chance of seeing Viscachas (a rabbitlike Chinchilla) and we may also spot Andean Fox. Our campsite for the night is at Puyoc (4100m / 13451ft); it's quite barren at this altitude and it is not uncommon for it to snow up here during the dry season so gloves and a hat are recommended. Today is the most spectacular day of the trek and quite a bit easier going than yesterday. From our campsite it's about a 13km walk to the village of Cuncani but most of that is downhill as the pass is only about a 2 hour walk right at the beginning. As we make our way to Cuncani we'll pass by snowcapped peaks high above us, serene mountain lakes (including Yanacocha - Black Water) and get to meet the local people dressed in their traditional bright red clothing. This side of the pass is completely different culturally to the other side and as we wind our way down from the pass your guide will teach you about the people and their way of life. You'll also get to learn a few Qhechua phrases so that you can interact with the local people. The focus of today is to meet the local people. Waking up early we'll be taken by our guide to one of the houses where we'll get to meet a local family. The people are incredibly welcoming and are just as eager to learn about you as you are of them - hopefully by now you'll have mastered a few phrases and be able to ask a few questions (much to everyones delight and amusement). After the visit you'll have the opportunity to give any gifts you've brought for the local people and also to buy some of the locally made alpaca products that the region is famed for. Leaving Cuncani it's just a short distance (6km) until we reach the hot springs of Lares. Along the way we'll pass through several small communities and see the people growing a variety of foods such as Quinua and Tarwi, we'll also probably spot flocks of Andean parrots flying overhead (they're easy to spot thanks to their piercing calls). After a relaxing dip in the hot springs we'll be picked up by our bus and driven back to the Sacred Valley from where we'll catch our train to Machu Picchu. Please note: we higly recommend booking the Huayna Picchu Mountain Climbing starting at 7:00 am so you will have access to Machu Picchu from 6:00 am which is more convenient in order to spend more hours in the Citadel of Machu Picchu. As a way to avoid any inconvenience with our clientes Llama Path offers 0.700ml aluminum water bottles FOR SALE at the office for as liitle as 15 Soles (USD5.00). Student Discount: US$20 (Requires Univeristy Student Card to qualify - you must NOT be older than 25 YO). Important: Prices Include mules to carry up to 7 kilos of your personal belongings. Machu Picchu Mountain climbing: USD 25.00 (Need to book in advance). Huayna Picchu Mountain climbing: USD 25.00 (Need to book in advance). Vistadome Train Aguas Calientes-Ollantaytambo: USD50.00 (Need to book in advance). Extra Night in Aguas Calientes: Depends on the type of Hotel desired (Need to book in advance). Student rate: In order to obtain this discount you must have a valid Student card. It is important you scan and e-mail this to us at the time of booking and that it is valid on the date you are booked on the Inca Trail/alternative trek (you will need to show the real Student card upon your arrival here in Cusco and in Machu Picchu). Payment of deposit: For any of our Adventure treks ending in Machu Picchu. 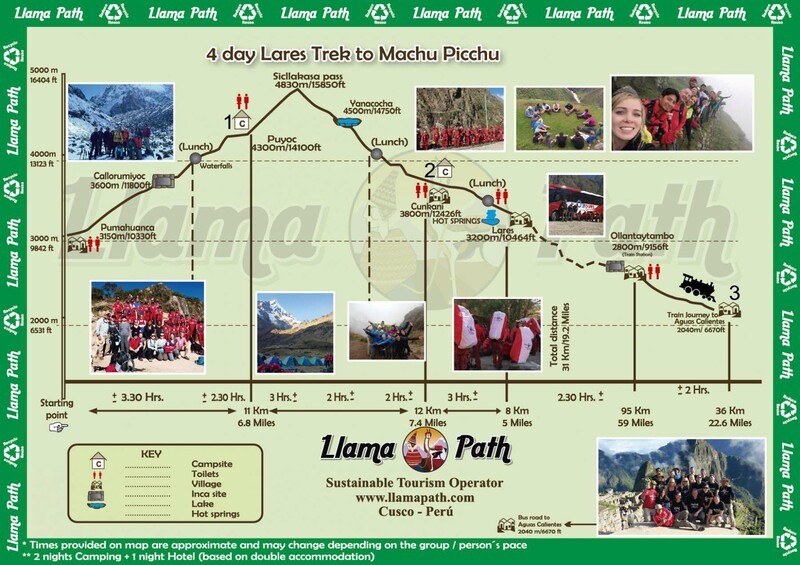 US$ 25 per person for the Lares Trek + Wayna Picchu or Machu Picchu climbing.